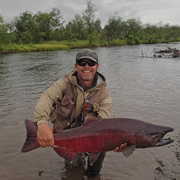 After running the Selway river in Idaho we decided to go to Alaska for a serious Float fishing trip. 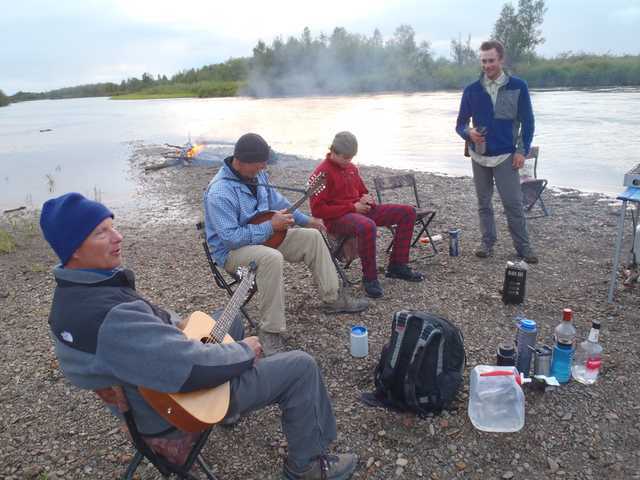 We decided on 10 days...certainly that would be enough time to float the 100 mile river. The bush flight in on a bluebird day was already enough to pay back for the effort we put in to getting to this western part of Alaska. We were left on a beach on a lake with our rafts, camping and cooking gear. 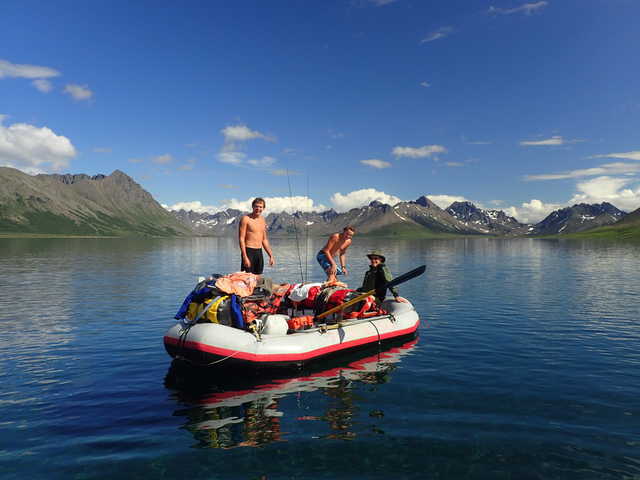 After inflating the rafts and packing for the trip down the river the boys set the tone by quickly diving into the lake. OK looks like anything can and will happen on this trip. A few fish and a few miles later we found the perfect campground. 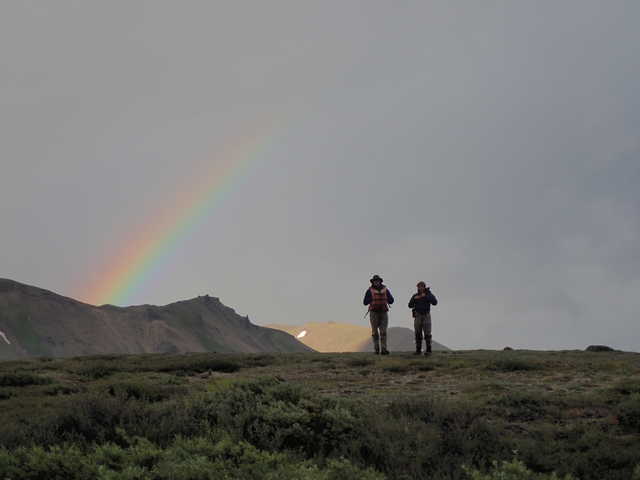 Where else would it be except at the end of the rainbow. We moved slowly down the river because everything captured our attention. The water, the mountains, the colors, the structure of the water and the fish we caught as well as the ones we did not see. Most of my trips are early to rise get into camp early. This trip was the complete opposite. But it worked. The 10:45 sunsets, the quiet surreal colors slowly evolving. Too slow to capture "the shot" but perfect paced to be etched into our memories forever. We found fish we could hardly imagine were real and we found numbers of fish we can hardly talk about because we hardly believe ourselves when the story comes out. We could float silently down the river while our smiles spoke volumes. We became closer each moment, each day and each night. 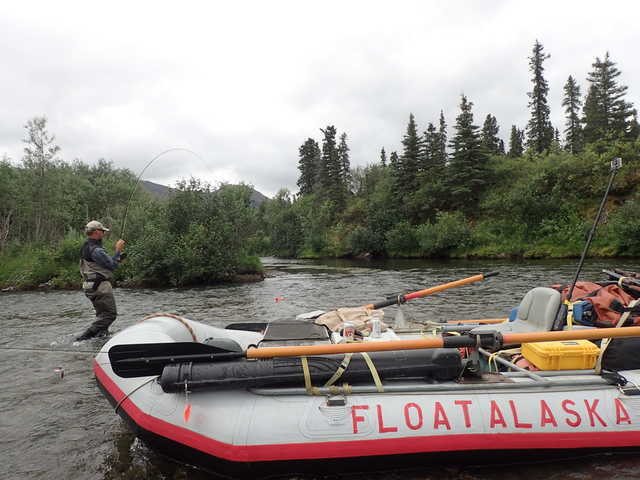 Float, Fish, Camp repeat! We found our rhythm, our pace, what we wanted out of our trip. We fished hard and then we hardly fished. We saw moose, caribou, wolves, foxes, hawks, falcons and eagles. Then we fished again. We wanted to hike to the top of a number of beautiful mountain peaks but it slipped away. Next time. This river had a class 4 and 5 rapid that we easily portaged. 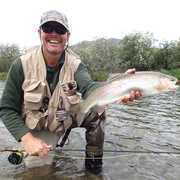 The rest of the river was mild compared to our whitewater trips in Idaho. We worked together as a team and enjoyed the "work". 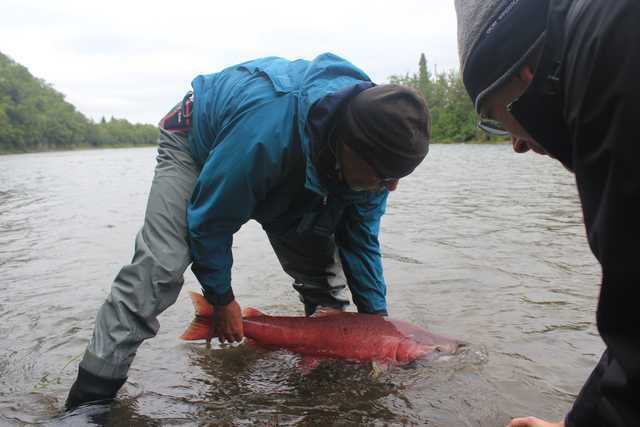 We were early in the season for the silver salmon. But we did manage to take a few. This little guy came just at the right time to become "Silver Sashimi" with wasabi and soy sauce. He was the perfect compliment to our Tri-tip steak we pre-froze and hauled up. I did make one major mistake on the trip. In an effort to distribute the food duties I asked the boys from Mississippi to bring up the potatoes. I was thinking about the weight alone and not the irony that the potatoes would have then made a round trip from Idaho to Mississippi to Seattle to Bethel Alaska. Oh well if we can travel that far I guess the potatoes should have nothing to complain about. 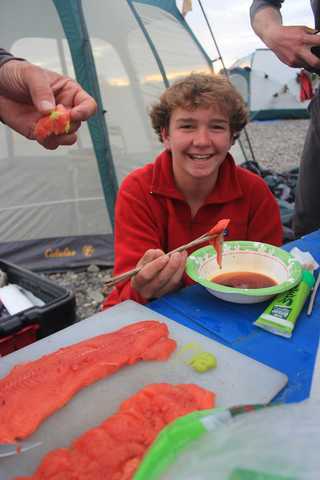 We caught 5 species of salmon-Chinook, Coho, chum, pink and sockeye. 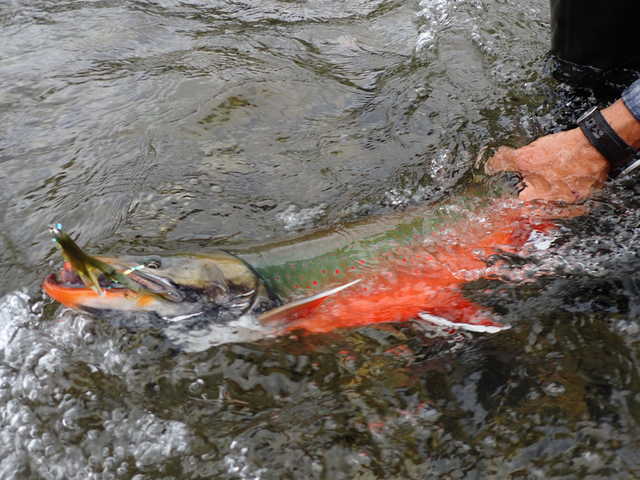 We caught rainbows on mice and found char, dollies and grayling from top to bottom. 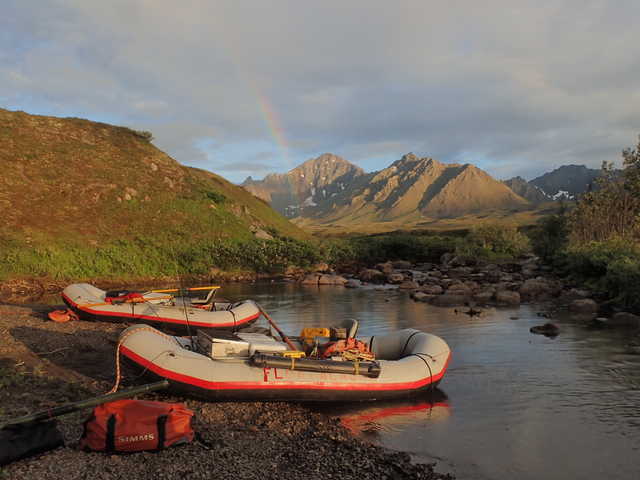 Hard to imagine 100 miles of river without seeing another raft, another boat, another person. But we did. Our last day on the river was a mix of happiness and remorse. We played music and sang. There were no critics in the group. We retold stories of the days before. We found it both hard to believe the trip was ending. 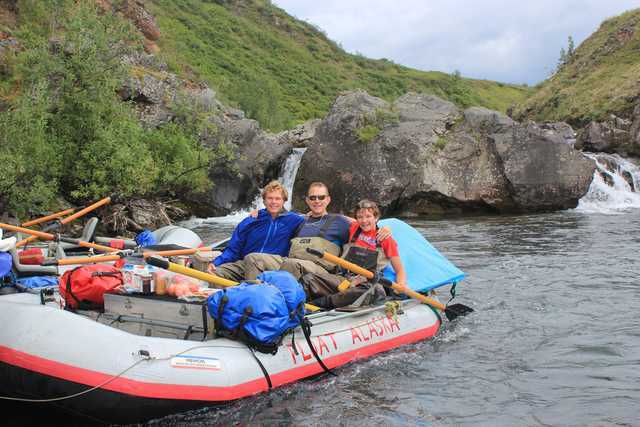 At the same time we found it impossible to believe so much had happened in our 10 days on the river. We have not talked about another trip yet.....but I have the distinct feeling the word "yes" will likely come out before I finish the words "Hey I was thinking about....."
So many rivers...so little time! Thanks to all for sharing their time with me!